We don’t let Leo play many computer games unless there’s some at least slightly intellectual redeeming aspect. Recently he’s become quite obsessed, and quite good at, “Where’s My Water” by Disney Games (hereafter WMW). In WMW you level up using the game physics (mechanics) to get water to ducks and a friendly alligator who is taking a shower. Before watching Leo playing this game I hadn’t quite realized just how motivating “leveling up” is to children. So I decided to try to use the same technique to get him to do some fairly complex math; more precisely, algebra. 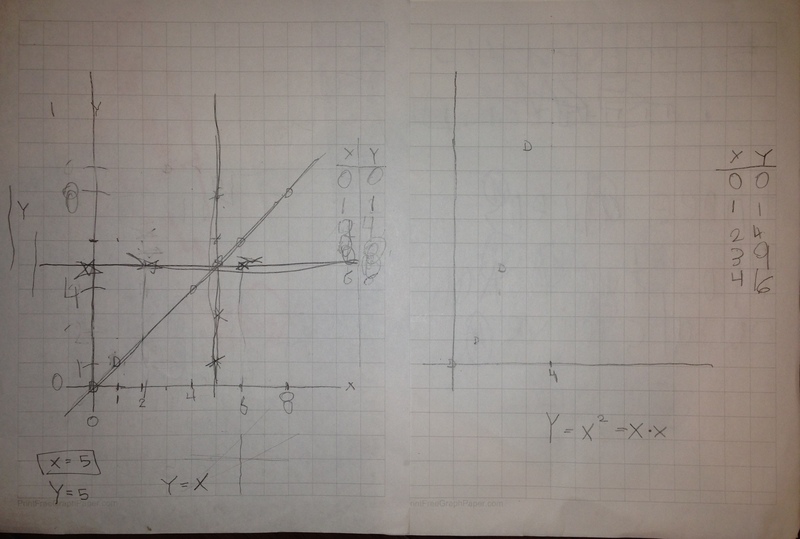 We played several different versions of this game, all of them revolving around a graph of a function and its equation. The idea is that you need to get the “water” (the graph line) to the “ducks” (the “D”s). you make a table (far right) of the XY locations of the ducks, and then try to figure out the function. The motivation of getting ducks to “level up” seemed to quite intrinsically motivating to Leo in all of the modes of this game we played.